Hello, everyone! It is finally reveal day and I am so excited to show you all what I made. Thanks again to Lori Anderson of Pretty Things for hosting and organizing this blog hop. I can’t imagine what a chore that must be. Previously, I posted about what I sent my partner, Pam, and you can also read about the tons of goodies she sent me. You’ll notice that she sent me SO MANY focal beads – so I had to get busy! I didn’t quite make something for every focal bead, but I’m proud of what I accomplished. May I present, my three complete necklaces for the 2017 Bead Soup Blog Party! So, I ended up with three long necklaces, all with some ribbon somewhere. So, the first one I finished was the ceramic button. I wanted to make it a pendant, so I used leather to make loops and glued a fabric flower (meant for scrapbooking) on the back. The necklace portion features some asymmetrical stringing of “beaded beads” made from filled netting stitch and Czech druks in fall colors. 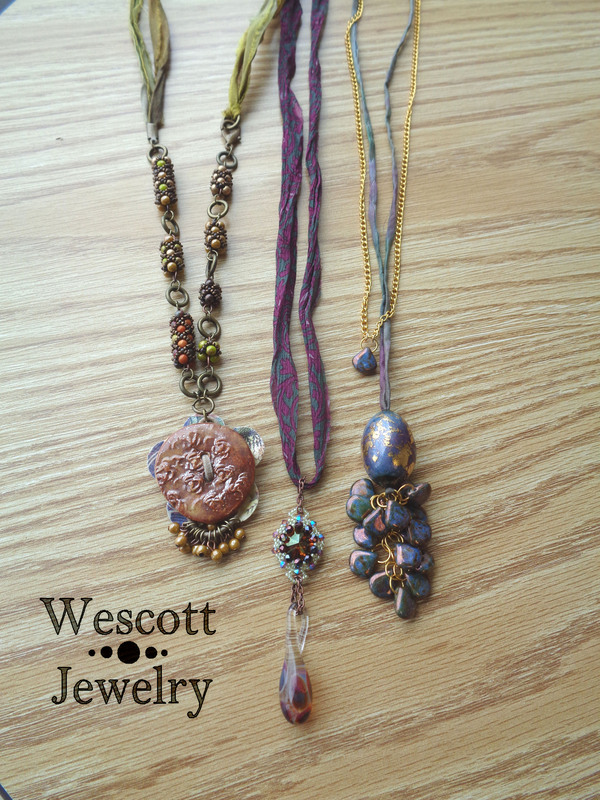 I them used brass rings and sari silk ribbon to finish off the necklace. The next one I made was for the delicate glass drop. I made a beaded bezel for the Rivoli using an adapted Gail Damm technique in colors that I saw in the drop. I thought the long delicate nature of the glass drop would be best served in a long necklace meant to hang mid-bust, so I strung it on a loooooong length of Sari ribbon. I used copper chain to attach drop to bezel and bezel to ribbon. My last finished necklace used this gorgeous gold-leafed bead. I fell in love with the colors under the gold leaf and the finish reminded me of some Czech drops I had in my stash. The color treatment was a perfect match, so I had to use them. I always struggle a bit when using handmade focal beads because they tend to be very large and I have trouble making my signature stitched pieces match the scale. With this one, I threw stitching out the window and focused on building volume with the drop beads. I finished it with yet another silk ribbon (I couldn’t help it – the color was PERFECT) and then decided to add a second strand of gold with a single drop to hover above the focal. Overall, I am really happy with these three necklaces. I think they utilize the beads so generously gifted to me by Pam and challenged me to step outside my comfort zone. I did have some beads that I didn’t get the chance to use, but since my wonderful partner sent me FOUR hoarded beads and change, I think I can consider this a victory, haha. I did have one necklace that I’m still brainstorming on. I think I’m going to make these coordinating beads Pam sent me into a bib necklace. Since that one isn’t completed, though, I am happy to celebrate the three that I did finish. It’s way more than I expected to accomplish. Be sure to check out what my partner made at her blog and then continue with the blog hop! There are so many amazing artists to explore. All the other participants are below the Read More. Happy Hopping! Samantha Wescott – You are Here! This entry was posted in Challenges and Blog Hops and tagged art, bead blog, bead blog hop, bead patterns, bead soup blog party, beading, beadweaving, beadwork, blog hop, bsbp. Bookmark the permalink. I really love your beaded beads – do you have a tutorial for sale anywhere? Well done, I am always happy when I can come up with 1 piece. Love your use of ribbon in all of your designs, you certainly did justice to what your partner sent. Thank you, Ann! I did my best! Pam gave me so many lovely pieces, it was tough to come up with enough ideas. Luckily, Sari Silk to the rescue, haha! Great job! I love all three of your necklaces. So pretty. Really beautiful. I love all of those long necklaces, and they are so romantic with the soft colors and the fabric. Beautiful necklaces! I glanced through more of your work while here – just lovely! Beautiful rustic designs, I also like those beadwoven beads that accompany the ceramic button – awesome idea! I REALLY love the blue long necklace. The gold highlights and leather lacing sure adds to the overall beauty of it. Thank you, Teresa! Adding that gold was a last minute thought and I am SO glad I did it. Hi Samantha, all three of your necklaces are beautiful. 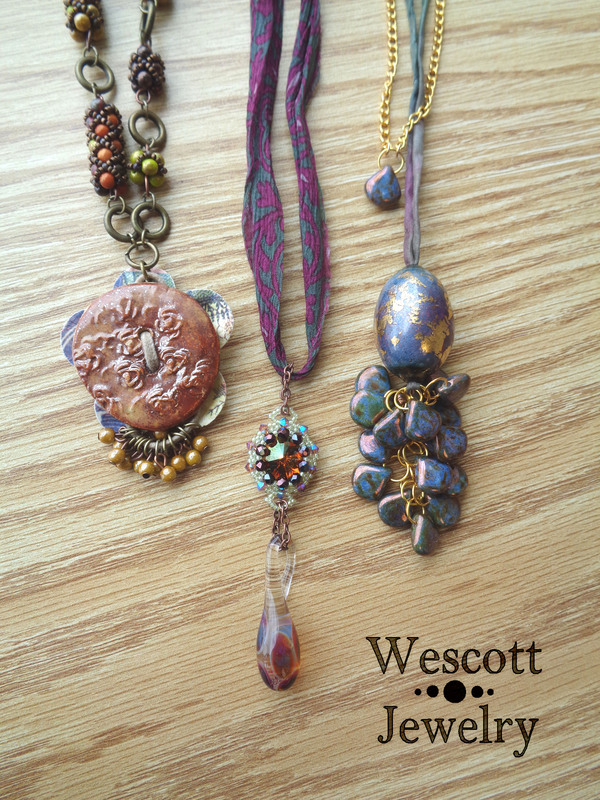 Wow, I love all three but especially the first one with the beaded bead sections – gorgeous! Thank you! That one was the first to pop into my head. My muse must have been in a good place that day, haha! These are truly special necklaces!! Fantastic job! I really like all the different colors, techniques and materials you used to make these three beautiful pieces! Wow!! You are amazing! All three pieces are beautifully made. You may have felt pushed out of your comfort zone, but the results are proof that you’ve got the chops : ) Your bead work is outstanding. It was my pleasure to be your partner. Wait..you MADE those beaded beads? So cool! They work so well with that necklace. You had so much going on with the soup you received, it looked quite challenging deciding what to use. Your three necklaces are each so different and equally stunning. Bravo! Wow! They’re all so stunning! Beautiful job! I really dig the way you were able to alter the button to make it meet your needs. It turned out so cool! Every single thing you did is gorgeous. The beads you made with the beads you were given, how you embellished the strands of your necklaces and the focals themselves – I love it all! You have a real eye for coordinating colors – the beads under the purple focal and the beaded bezel above the glass drop are perfectl I’ve no doubt you’ll enjoy wearing these long into the future. THAT BUTTON with the beaded beads! I LOVE THAT! And the blues are terrific. Just excellent work. Oh my goodness, that’s some stunning beadwork! I think you did justice to each of those hoarded beauties!